From garden plot to dinner plate, certain special flowers – among them spicy nasturiums, sweet violets, perfumed roses and pungent lavender — taste as good as they look and smell! Growing edible flowers is an ancient art; it was already a consuming passion when Apicius (a famous Roman gourmet and lover of all things luxurious!) included recipes for them in his 1st Century Roman cookbook. Medieval cooks picked frilly, clove-scented dianthus (also known as “gilly flowers”) for use in sweets and Colonial American housewives prepared floral conserves, cordials and soothing teas. Today’s most creative chefs use flowers for style and substance. LA restaurateur Wolfgang Puck employs golden zucchini blossoms as a container for shrimp mousse. Sooke Harbour House, an inn near Victoria, British Columbia, serves an almost too-pretty-to-eat salad composed solely of flowers. Lyle’s of London’s Chegworth Salad with its bean flowers, pea flowers and nasturtium is a menu favorite. 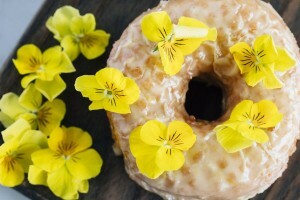 And just to show you that edible flowers work with any kind of food, Sidecar Donuts in Santa Monica features a fresh lemon cake donut topped with lemon glaze and yellow viola blossoms. Clearly spa and restaurant chefs worldwide know that a few colorful, edible petals can make any dish extra special! 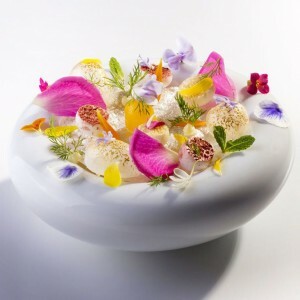 The blossoms of culinary herbs offer a good introduction to edible flowers. The torn petals of purple chive flowers, with their mild onion taste are lovely sprinkled over the leaves of bibb lettuce. Minced sage, thyme or basil blossoms make savory additions to butter or cream cheese. The starry blue flowers of borage contribute a cool cucumber taste to a summer salad and the delicately sweet lipstick-red firecracker-shaped flowers of pineapple sage is terrific sprinkled over fruit. Among the baby carrots, purple potatoes and yellow peppers available at upscale grocers it is not uncommon to find small plastic packets of multicolored edible flowers. But, growing your own edible garden is easy and it guarantees that the flowers are pesticide-free. Choose a sunny spot near the kitchen door or in the border of the garden. Perennials with edible blossoms require good soil preparation, excellent drainage and a permanent site in your landscape. Annuals are grown just as you would grow annual vegetables, in rich, moist, well-drained soil in full sun or light shade. 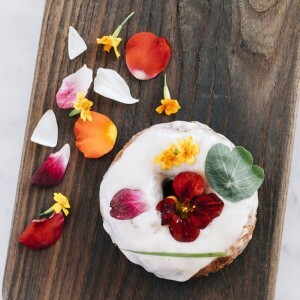 Once you’ve positively identified a plant with edible flowers, harvest them early in the morning before the sun dries them out and remember that just-opened blossoms are the tastiest! Chill them after picking and rinse right before serving. The edible orange petals of calendula can be added to the cooking water of rice to color the grains a golden hue — thus earning the flower the title of “the poor man’s saffron.” Calendulas should not be confused with French Marigolds or African Marigolds which are annuals with a disagreeable, metallic taste. But, the brilliant yellow blossoms of “Lemon Gem” Marigolds are wonderful and add a tart citrus flavor that enhances pasta dishes, vegetables and salads. Rose petals can be used to scent a sugar bowl, to make rose ice cream or to flavor honey that will be added to chicken or to the dessert baklava. Runner bean blossoms can be used to garnish bean soup. Chopped English or French lavender flowers adds a delightful scent to applesauce and Johnny Jump-Ups are striking garnishes to dessert souffles. # Place hibiscus or gladiola flowers in a clear glass bowl and fill it up with your favorite dip. # Add a sprinkling of edible flowers to your green salad for a splash of color and taste. # Freeze whole small flowers into ice cubes for a pretty addition to punches and other drinks. # Use in oils, vinaigrettes and marinades. Never use non-edible flowers as a garnish. Assume if your guests see it on a plate, they will eat it. If you’ve never used edible flowers before, use them sparingly at first and give your digestive system time to adapt to them. Always, always check a plant toxicity list first before using flowers in your recipes! 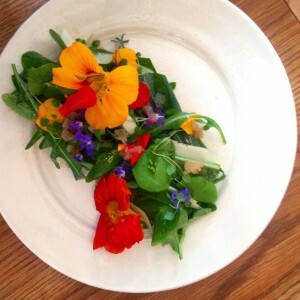 Want to read a bit more about cooking and garnishing with edible flowers? Check out “Edible Flowers, A Kitchen Companion” or “100 Edible and Healing Flowers.” You can find those and many recipe books at Amazon.com.